Leptin antibody LS-C48878 is an unconjugated rabbit polyclonal antibody to mouse Leptin. Validated for WB. 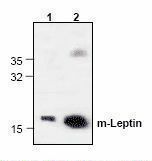 Leptin antibody was raised against e. coli-expressed recombinant mouse Leptin. Western blot of Leptin antibody.